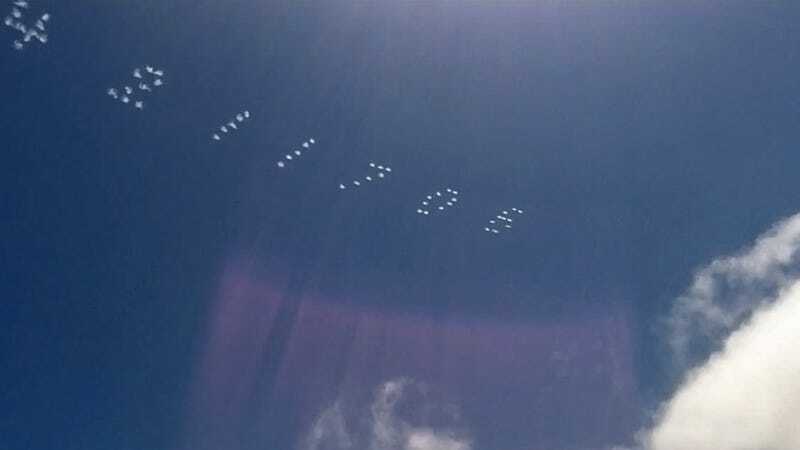 Any eyes in San Francisco that weren't focused on Apple's announcements yesterday might have noticed something peculiar in the skies over the Bay area. As part of the ZERO1 Biennial—a months long festival celebrating the coming together of art and technology—an artist known only as Ishky used several planes to skywrite the first 1,000 digits of Pi over the city, in a piece cleverly (and obviously) titled Pi in the Sky. The stunt used five planes flying in formation equipped with synchronized dot-matrix-like smoke printers to slowly spell out the sequence. Each digit measured almost a half-mile in height, so anyone on the ground could easily distinguish the numbers, even though the planes were flying at almost 10,000 feet. A sixth craft was used to film the stunt from the air, but the wider view from the ground made the piece seem far mor grandiose.